In my role as an archivist at the Leo Baeck Institute, I spend quite a bit of time with our volunteers. The volunteers are nearly all elderly men and women who left Germany as children, with the exception of one who stayed in Europe and managed to survive. They often tell us about their childhood in Germany–tidbits about daily life. 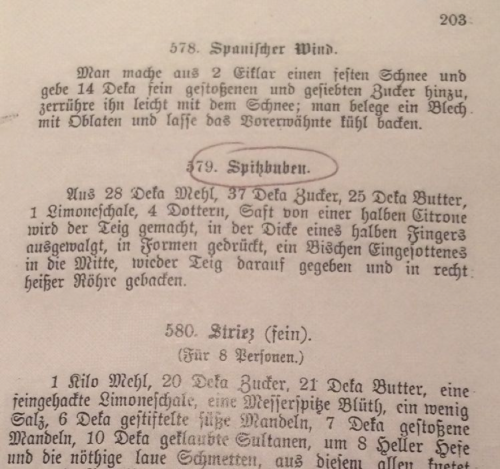 I recently wondered whether German Jews, who were overall quite assimilated to the customs of the larger German Christian population, didn’t also had a practice of making cookies for the Winter holidays. We know that some German Jews decorated their homes with Christmas trees, gave presents, and had large meals for the holiday just like their non-Jewish neighbors. 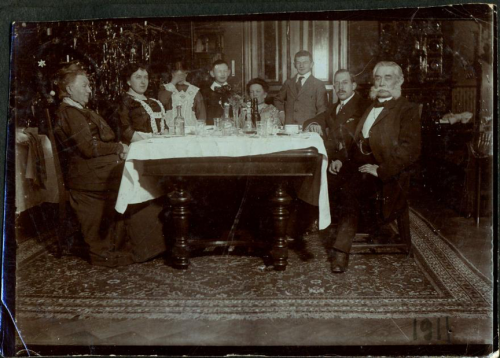 In our archives, for example, we have a picture of a Jewish family celebrating Christmas. 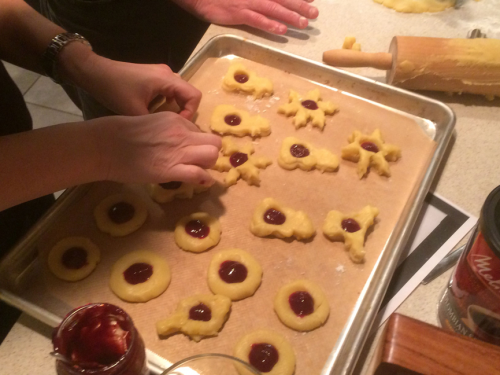 I asked one of our volunteers who grew up in Berlin in the 1920s and 1930s about Christmas cookies. “Oh yes,” she enthusiastically responded. “Each year at Christmas we would have trays of cookies baked. We especially liked the cookies with jam in the middle, but there were many kinds.” She also said they used cookie cutters to make forms of Christmas trees, stars, and other holiday images. 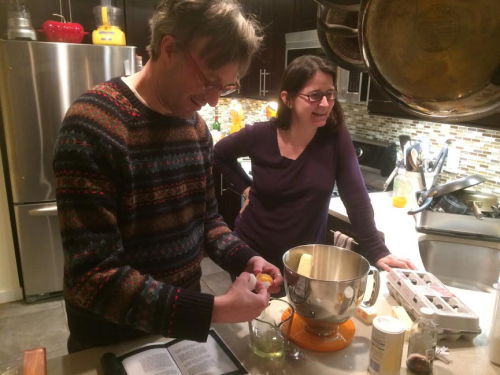 So a group of us decided to pull out of the Leo Baeck Institute library and archives some cookie recipes for inclusion in our food blog. 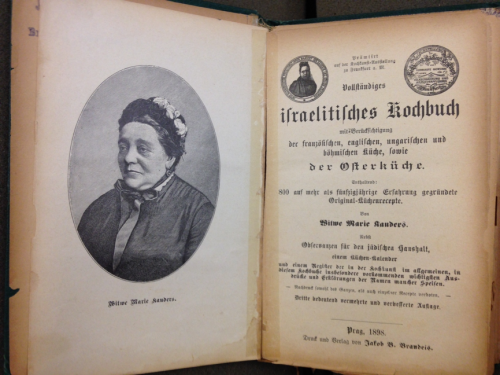 The library has a number of old cookbooks that had once been owned and / or written by German-Jewish women. We settled on Vollständiges israelitisches Kochbuch mit Berücksichtigung der französischen, englischen, ungarischen und böhmischen Küche, sowie der Osterküche. This book was published in 1898, authored by a woman named Marie Kauders. In English the title would be Complete Jewish Cookbook with observance of French, English and Bohemian cuisines as well as dishes for Pesach. Marie Kauders was a Jewish woman who lived in Prague. Following the death of her husband she wrote cookbooks for Jewish households and also ran a cooking school for Jewish girls, presumably in Prague. She was quite popular, and her books often were republished in the following years. Little is actually known about her personal life. If you know more about her, we’d like to hear it! We chose to make two cookie recipes from her cookbook. 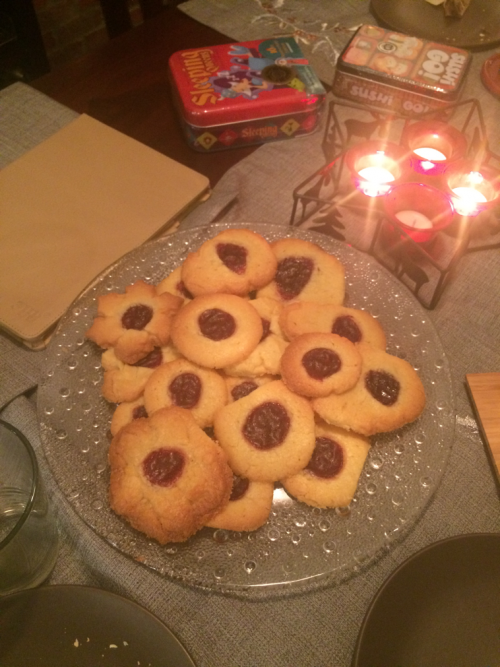 The first cookies are called Spitzbuben which can be translated as “Mischievous Boys.” This cookie is a linzer-looking cookie, two layers of cookie dough baked with some red jam in the middle. In Austria these cookies are called Husarenkrapferel which can be translated maybe as “Hussar Doughnuts,” the Hussars being the Hungarian light-horsemen of the military in the days of Austro-Hungary. Maybe this style of cookie is Hungarian in origin? I suspect this cookie was just called different things in different places. Take 28 Deka (decagrams = 10g) Flour, 37 Deka Sugar, 25 Deka Butter, 1 lemon peel, 4 egg yolks, juice from half a lemon and make into a dough, with the thickness of a half a finger, in printed forms, a small portion of jam in the middle, again the dough afterwards add and in a hot oven bake. Eingesottenes is a word for jam that traditionally was mostly used in Austria, and I imagine coming from Prague it was an Austrian-flavored German that Kauders used in her cookbook. As is typical with the old recipe books, “the woman of the kitchen” is expected to know quite a bit already. This recipe implies the woman already has learned, perhaps from her mother, how to mix together ingredients and form the shapes, how to add the jam and at what temperature and for how long to bake the cookies – all things that today would be included in the recipe. Not a recipe for the faint-hearted! Let me say that my friend made a whole party of it with a Christmas tree, many other good things to eat, Glühwein, candles, and even some gifts. It doesn’t hurt to make holiday cookies surrounded by people, food, and decorations. We weighed out all the ingredients in the recipe. We talked about how in a kitchen of the time, the egg whites would then have been used to make something immediately following, so they weren’t wasted. We also used them to make a second item. This was not a recipe for the faint of heart. It contains two sticks of butter. Two sticks of butter! One reason I love these old recipes is the utter lack of fear about using butter. I then proceeded to separate the eggs, pouring the yokes in the mixing bowl. We then mixed all the ingredients together. The butter was still somewhat cold, but luckily we had a nice electric mixer to use. Otherwise be sure first your butter is room temperature. While everything was mixing we turned on the oven. 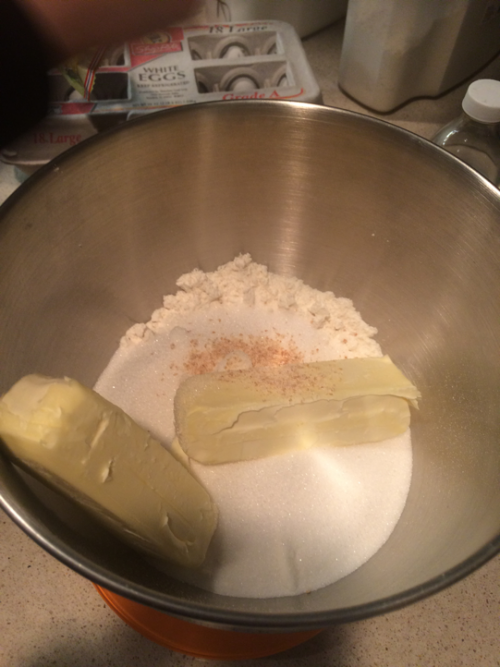 The recipe gives no temperature directions, but my friend figured “the standard” for cookies would work–350 degrees. Here I am with my friend (the one who is actually a good baker) hard at work. 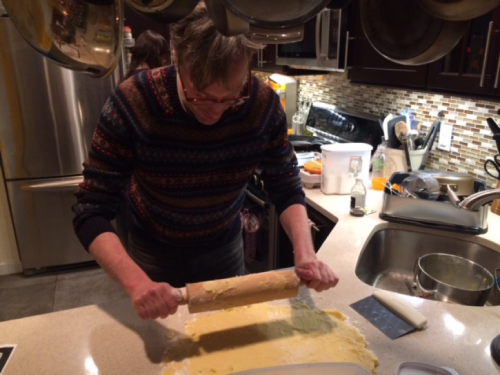 Now the dough was mixed and we floured her counter top and I set to work rolling the dough out. This was not as easy as it sounds. The dough was very moist and stuck largely to the rolling pin. I had to keep adding flour to both the dough and to the rolling pin itself to remove the dough that was stuck on it. So keep the flour at close quarters. Another friend with us said it probably would have worked better if we had taken the dough and then refrigerated it first for a period of time, and so we recommend you try that. As for us, I did the best I could and in the end resorted to patting it down with my hands to the desired thickness, which the recipe states as the thickness of half a finger (a finger laying flat length-wise). You can see here how it is basically two cut-outs of what image you want, put on a cookie tray (be sure to put a sheet on the tray or you could probably grease the tray). For the top form, you make a hole in the middle of it (we actually used the top of a corkscrew….you can find whatever works) and then fill that hole with jam. My friend had made a mixed-berry jam from scratch, so you can imagine how good it tasted. This recipe made a lot of dough, and in the end we tired of the cutting out of forms and simply made a circle with an impression in the middle and filled the impression with jam (as you can see on this picture as well). Our dough was very sticky, so often the forms fell apart when we tried moving them to the cookie tray, but hopefully if you first refrigerate the dough a bit this will prove less of a problem. Keep that flour around for dealing with this sticky dough! Once the tray is full of cookies you are ready to bake. We baked them for 20 to 25 minutes, or until slightly brown on the edges. The Spitzbuben were good, but not great. I was thinking when finished they would be a drier cookie, but in truth they were kind of moist and a bit too chewy for my taste. If I were to make this recipe again, I would try to make them a bit dryer and even a little crumbly. Still, they were pretty good and certainly they went quickly.